Join us for the Class of 2019 Enshrinement Week! BEST VACATION EVER! All the little extras meant a lot! We paid a lot for this event and we felt like every dime was worth it. Overall we had a FANTASTIC TIME. Everything went off without any hitches. Loved seeing a band at the tailgate party. Was excited to see the Steelers mascot join in on the fun. My friend is still talking about the Tailgate Party. That alone was worth the trip to Canton. This has been the greatest experience with my youngest son for the past 6 years in a row!! Superb beyond my expectations. It was the first time I have used QuintEvents, but have to say it was one of the best experiences I have ever had. 2020 Super Bowl Ticket Packages On Sale Now! Atlanta Falcons & Denver Broncos to play in 2019 Hall of Fame Game! 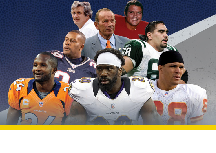 Hall of Fame Experiences is the Official Experience Provider of the Pro Football Hall of Fame for our annual Enshrinement Week Powered by Johnson Controls and Super Bowl packages. The use of the term Super Bowl herein is for factual description purposes only. Hall of Fame Experiences is in no way associated with, endorsed, sponsored or authorized by the NFL or any NFL teams.